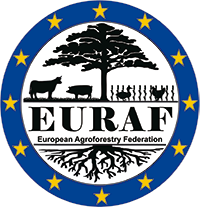 The European Agroforestry Federation (EURAF) organised the First European Agroforestry Conference in Brussels, on October 9-10, 2012. 08:00-10:00 SESSION 2 (Ferraris auditorium): Hot spots, What's going on in Europe for agroforestry? 10:30-12:30 Parallel SESSION 3A (at the European Parliament) "Agroforestry: Trees for a Sustainable European Agriculture"
20 EURAF delegates participated in the meeting. Agroforestry at the European Parliament from Marcello Faraggi on Vimeo. 14:00-15:15 SESSION 4 (Ferraris auditorium): Fresh progress, novel evidence. What’s going on in Europe for agroforestry? 15:30-17:00 SESSION 5 (Ferraris auditorium): Building European consortia to address European calls dealing with agroforestry. EURAF wishes to thank the Flemish Government for their support in providing the Boudewijn and Ferraris auditoria for this event.